StFX philosophy professor Dr. Christopher Byrne has been recognized internationally for the quality of his scholarship. 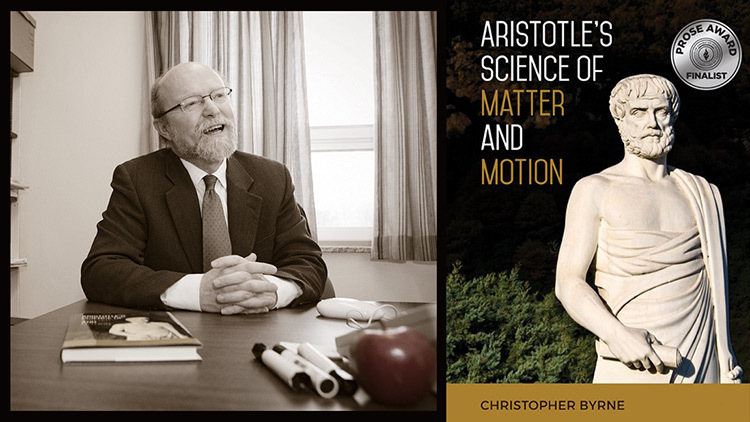 Dr. Bryne’s new book, Aristotle’s Science of Matter and Motion, published by the University of Toronto Press in 2018, has been named a finalist in the philosophy section of the PROSE (Professional Scholarly Excellence) awards for 2019 given out by the Association of American Publishers. These awards honour scholarly work of extraordinary merit that make a significant contribution to a field of study in a given year. “This is fantastic news. Being nominated for this internationally recognized publishing award is a significant academic honour and we are delighted to see Dr. Byrne receive a nomination for his book Aristotle's Science of Matter and Motion,” says Dr. Richard Isnor, StFX Associate Vice President, Research and Graduate Studies. The list of nominees in the awards 49 categories is pretty much a who’s who of academic publishers, representing not just major U.S. publishers, but those from around the world. “I was elated,” Dr. Byrne says on the honour. “Surprised and elated. I didn’t realize it had been nominated in the first place,” he says until he received a congratulatory message from his editor. His book, which deals with Aristotle’s contributions to physics, was one of three named as finalists. While he didn’t win the category, it’s a win to be shortlisted. Hundreds of books on philosophy would have been published in the year. “It’s an honour just to get on the list,” he says. It’s not the first recognition the book has received. Dr. Byrne received a grant of $8,000 for the book from the Social Sciences and Humanities Research Council’s (SSHRC) Aid to Scholarly Publications through the Federation for Humanities and Social Sciences. It is a competitive process and a prestigious award. “I was quite gratified to receive this award, as the topic of my book is not exactly on everyone’s lips. Still, I was moved to write this book because there is a curious view of Aristotle that is still quite widespread: on the one hand, he is considered one of the most important figures in the history of philosophy, indeed, in many fields, having made important contributions to biology, ethics, political philosophy, logic, metaphysics, rhetoric, and the theory of tragedy; on the other hand, he is held by many philosophers and historians of science to have failed so badly at physics that he held back its development until the seventeenth century when the Scientific Revolution finally overthrew Aristotelianism,” Dr. Byrne had said when receiving that award. “So the puzzle that drew me to this topic was how such a great thinker could have failed so badly in his understanding of the material world. Matter is important for Aristotle because he holds that all perceptible objects are ultimately made from physical stuff of one kind or another and that this matter is responsible for many of their basic features. He also investigates the nature of change in general, independent of the specific nature of the object undergoing a change; here, he begins with locomotion, the most fundamental kind of change. Finally, Aristotle offers an account of the basic features of matter and motion that is quantitative and non-teleological. His use of final causes in biology and elsewhere is compatible with his quantitative, non-teleological account of matter and motion, because in his view all goal-directed changes take place in physical entities more complex than the material elements. “Indeed, Aristotle’s biology presupposes his physics because goal-directed changes presuppose non-teleological changes in matter. For Aristotle, then, matter matters a great deal,” says Dr. Byrne.